“Regeneron’s Eylea (aflibercept), a vascular endothelial growth factor (VEGF) inhibitor, is FDA approved for DME, DR in patients with DME, macular edema (ME) following retinal vein occlusion (RVO), as well as for neovascular (wet) age-related macular degeneration (AMD). Following successful Phase III trial demonstrating that Eylea can reverse disease progression in patients with non-proliferative DR without DME, Regeneron is now seeking approval of its blockbuster eye drug encompassing a much wider target among the diabetic patient pool. ‘‘Eylea sales have superseded its rival’s (Lucentis’) global sales since 2015, generating almost twice the sales of Roche/Novartis’ anti-VEGF in 2017; $6.3bn and $3.3bn, respectively. In fact, Eylea dominated global ophthalmology drug sales in 2017, with a market share of approximately 40% share in the ophthalmology space, according to GlobalData’s Report: ‘The Biopharmaceutical Industry in 2017: Highlights by Therapeutic Area’. Eylea’s popularity is partly due to its labelling, which allows for the intravitreal (IVT) injection of the drug in 8-week dosing interval compared to a more frequent 4-week dosing regimen for Lucentis. “Eylea’s lead position is however about to be threatened by the foreseeable launch of an even less frequently administered anti-VEGF, Novartis’ brolucizumab (RTH258), in 2019 for the treatment of wet AMD. Wet AMD comprised the biggest share of key ophthalmology markets in 2016 and accounted for almost half of all Eylea sales in 2017, according to GlobalData’s reports: ‘The Biopharmaceutical Industry in 2017: Highlights by Therapeutic Area’ and ‘Age-Related Macular Degeneration: Global Drug Forecast and Market Analysis to 2026’. 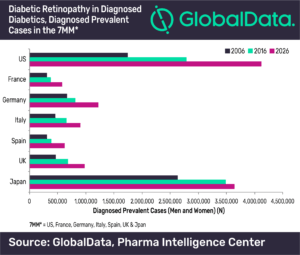 “While the diagnosed prevalence of DME comprises about 1 million diabetic patients in the 7MM (US, France, Germany, Italy, Spain, UK, and Japan) DR encompassed a much larger patient population of about 9.2 million diagnosed prevalent cases estimated in the 7MM in 2016, according to GlobalData’s report: ‘EpiCast Report: Macular Edema – Epidemiology Forecast to 2026’.